Review There’s no doubt that smartphones are getting more robust. Both the Sony Xperia Z and the forthcoming Samsung Galaxy S4 Active boast IP57-rated resistance to dust and water intrusion which is handy if you take your phone to the beach or the pool and come over all clumsy. Drop either of them out of a third-floor window on a building site, or drive over them in a Range Rover, though, and it will all end in tears. 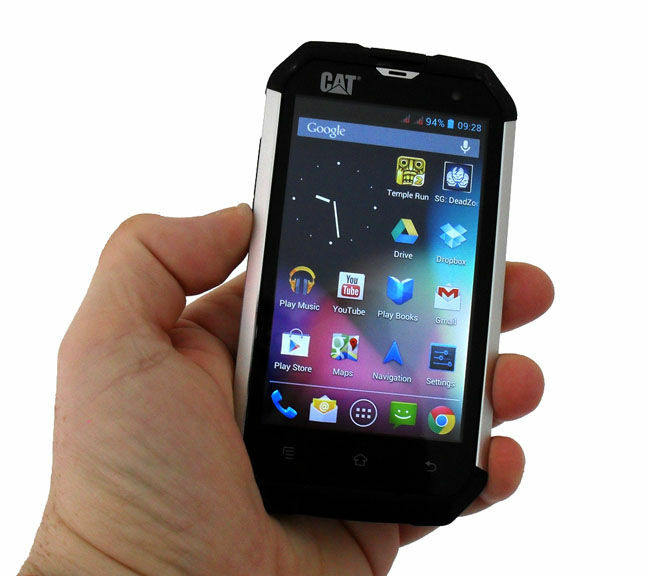 The Caterpillar Cat B15, however, is designed to survive just such abuse, as you’d expect from a handset designed by the folks who make big yellow construction equipment. Or by a company licensing the big yellow brand, as Bullitt Mobile has here. Bullitt Mobile’s B15: the Cat with nine lives? The B15 is currently the only viable hard-as-nails smartphone on the market. JCB’s discontinued Pro-Smart can still be picked up here and there, but it boasts a hopelessly out-of-date spec: Android 2.3 and an 800MHz processor, anyone? Sonim’s handsets may be as tough as old boots but they are also as dumb as a bag of hammers. The B15’s specification on the other hand isn’t too shabby. You get stock Android 4.1.2 running on a 1GHz dual-core MediaTek MT6577 Cortex A-9 SoC; a 4-inch, 480 x 800 screen; 5MP and 0.3MP cameras; and a 2000mAh battery. Granted, that spec isn’t going to tempt anyone away from an HTC One, but it’s a solid enough offering for a tough phone with a £285 SIM-free sticker price. Besides being as ‘ard as a cockney gangster in a Guy Ritchie flick, the B15 has another unusual feature: two SIM slots, complete with a usefully comprehensive menu with which to manage them. Changing which SIM does what, or switching one off completely, is the work of seconds, which should help keep some clear blue bathroom sealant between your work and private life. 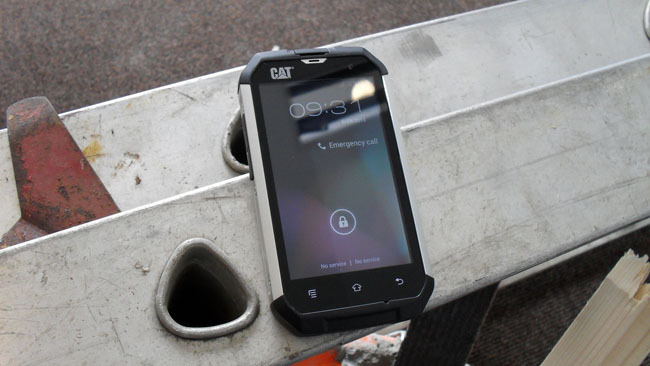 While the B15 certainly looks like a device designed for life on a building site, Caterpillar hasn’t gone overboard with the phone’s styling. Sure it’s quite a square and chunky old lump but it’s still small. At 170g, it’s only a smidge heavier than a Nokia Lumia 820. And it’s smart enough to pass muster down the boozer after knocking-off time. It’s obvious from the get-go that some serious thought has gone into the design. The Caterpillar-yellow volume keys are well separated to aid gloved-hand usage, while the camera button between them requires a three-second push to activate, the better to avoid accidental launches. The power button at the top is similarly designed to be easy to activate deliberately but difficult to do so accidentally. 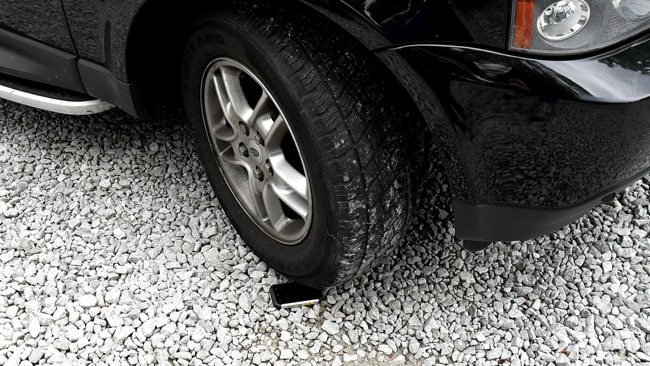 Another clever touch is the micro USB port cover. If the rubber plug ever breaks you can just unscrew the bit that’s still attached to your phone and replace the entire thing. You can’t do the same with the 3.5mm audio jack cover on the top of the phone but it’s so robust I can’t imagine how you’d ever rip it off. Of more importance in everyday use are the 15mm-thick square sides, which make it a very easy device to hold firmly with cold and wet hands, or while wearing gloves. That said, the touchscreen isn’t one of the magic works-with-gloves types. Officially, the B15 is certified to IP67 standard which means it’s dustproof and waterproof when dunked in up to one metre of water for 30 minutes. But that’s only part of the story. Thanks to thick silicon rubber bumpers at the top and bottom, and aluminium side panels, the B15 can survive a 1.8m drop onto concrete. I know: I dropped one from a second-storey window at closer to 3m onto a stone patio, and no harm done. I also drove over it in a Range Rover Sport on a gravel drive, left it overnight at the bottom of a nearby stream - so much for the 30-minute dunking maximum - and then stuck it (after a wash) in a pint of Banks’s Mild until I got thirsty. It survived all those experiences none the worse for wear. 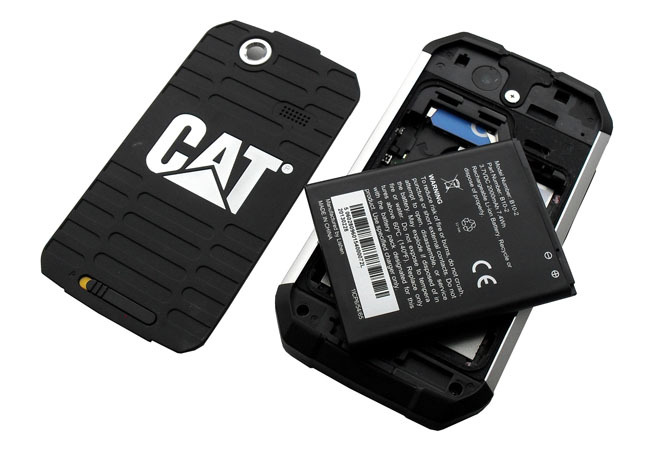 Next page: The Captain Scarlet of smartphones?